Our US ambassador Valeri Logue tells us how the Shannon College for Hotel Management is the place for students with a competitive edge. 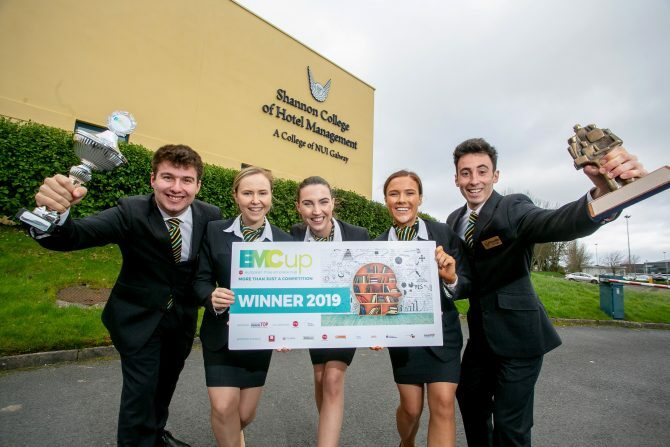 Whether we’re dominating the EM Cup in The Netherlands, the CATEX competition in Galway, the Irish Hotel International Business Games in Dublin, or the World Skills Battle for Food & Beverage, Shannon students are there and giving all a run for their money! There’s an old saying that says some people are scorched by the fire, others are born from it. Here at the Shannon College of Hotel Management our students live for the opportunity to find out what we’re made of. Shannon’s reputation is not only infamous for its employment record but for our relentless pursuit of excellence and fierce competitive appetite. Our team of third year students dominated at this years EM Cup, an intense marketing and hospitality competition, where they won best team pitch, best debate, best online photo, and first place overall. The CATEX competition tests competitor’s kitchen and bar-tending techniques. My fellow Shannon students Harry O’Reilly brought home a bronze for the cocktail competition and Anna Hevers took gold for the Open Fish class — also winning Junior Grand Prix Chef of the Year 2019. Our fourth year team brought back the silver in this year’s Irish Hotel International Business Games where management skills were measured against the nations’ best and brightest. This year’s World Skills event, that measures contestants knowledge and skill level, will be held in Russia. Our two third year representatives Ian & Ruairi are confident in their ability to produce award-winning results with their meticulous service standards and vast knowledge. Shannon’s name is synonymous with success and award-winning performances, yet we here at Shannon see it as much more than that. Being a student here isn’t just about being competitive but being surrounded by a community that supports you at every stage of the journey. Opportunities for success are encouraged, nourished, and bountiful at Shannon College for Hotel Management. So whether you’re interested in playing on the A-team or supporting from the bench, Shannon College is a place for winners and a welcoming place for anyone willing to try.